Yesterday I wrote about the Seabaugh family that lived next door to us on South Sprigg. They were such an influence for the good in my life and I am thankful for the many memories they gave me. It is no secret to my family and close friends that there were no good memories being made at my house; so, I found family wherever I could. As Forrest Gump would say “And that’s all I want to say about that”, at least for this site at this time. Another family that influenced me with many good times was a family that would seem the least likely to do so. The Webers lived on the alley next door to the Stafford family (which I plan to write about later). They were siblings, Louis, Mary, & Loretta, all never married. They all suffered from Muscular Dystrophy, Louis being the most advanced. I only saw him get out of his recliner once the entire time I knew them and I was there most everyday. He could not sleep lying down flat because he was unable to breathe, so he spent his time in a recliner next to the window. He was one of the most intelligent people I have ever met and he taught me everything he could. He and his sisters instilled in me a love of reading by loaning me books. The rule was that I could borrow a book and when I brought that book back I could borrow another one. My first contact with the Webers came about through my best buddy, Brenda Stafford, who lived next door to them. Brenda was paid 10 cents to walk to the grocery store and pick up their groceries. They got their groceries from Sheepys, which was located on the west side of Sprigg Street in the same block as the Womack Drug Store. They would call in their order, Sheepys would bag them up and all Brenda had to do was carry them back to the Weber home. Since I hung out with Brenda a lot, I would usually tag along. The first time I went with Brenda to the Weber house I was pretty “creeped out”. I couldn’t believe she was actually going to go up to their door and knock. Their house was a dilapidated shanty up on concrete blocks. 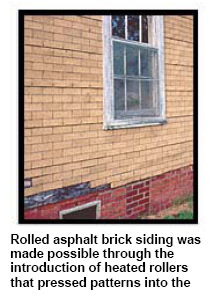 It had siding that was supposed to look like bricks. The windows had a thick coating of dust from the alley. The porch sagged and the floor boards looked like they had never been painted. I tried to talk Brenda out of going up there but she insisted that it was safe. Mary answered the door. I instinctively stepped back a little behind Brenda. The only thing about Mary that wasn’t scary was her smile, a wide yellow-toothed one. Her hair was dirty-looking, her old house dress was worn and almost shiny along the collar and front button placket. By far, the most vivid memory is the smell coming out of that open door. I held my breath as long as I possibly could, then fled off that porch just as soon as Brenda had received her dime for delivering the groceries. My mother was one of those 50’s moms who kept the house so clean that you could have safely eaten off the floor. Dishes were never left undone. And the dirty clothes barely hit the bottom of the hamper before she had them washed, dried, folded and put away. Germs didn’t have much of a chance in our house. So, needless to say, I was appalled at the possible condition of the Weber home after smelling the putrid aroma and seeing Mary’s lack of grooming. What I didn’t know was that Mary was the best-looking of the three! And, even though I didn’t see inside the house, my imagination ran wild about what it must look like. By the expression on Brenda’s face, she was actually considering it. Then Mary said that they would pay each of us $1.00 each time we cleaned. One dollar!! That was as much pay as 10 trips to the store! What we could buy with a dollar was huge at that time. We could get 2 pieces of candy for 1 cent, a candy bar for a nickel; this was awfully tempting. But, then reality hit me; me – go in that house? Me, touch anything in there? No way! Then I heard Brenda saying “Yes”. Mary said she wanted one of us to clean the floors and one to do the dishes. I was not an assertive person at all and I just stood there and let Brenda make the deal. I don’t know if Mary saw the look of total fright on my face but, if she did, she did not say anything about it. I am thinking I was probably as white as a ghost at that point. Now the Webers had pets, a little chihuahua named Mitsy, and some caged birds. I had seen the little dog at the door with Mary. Thinking that the floor would probably have doggie doo on it, I opted to do the dishes. MISTAKE! Doggie doo would have been much easier to clean up. Upon entering the kitchen, which was the first room as you went in the door, I saw the sink full of dirty dishes; then, the table full of more stacked up dirty dishes; then the stove covered with dirty pans. The dishes in the sink had been there so long that there was liquid in them, which I assume started out as clean water, but which was now green and had something floating on top that appeared to be sort-of sponge-like. (Do you feel like throwing up yet? I do.) But, wait, it gets worse. There was a pan on the stove with a lid on it. Inside that pan was something that should never be seen in a kitchen, much less in a cooking vessel. I hate to actually say what it was because it is so extremely gross but I will give you a hint. Women use them once a month. Ugh!!! I guess it was too far to walk to the bathroom. ‘Nuff said. Brenda finished up the floors long before I finished the dishes. I could have kicked myself for choosing the dishes instead of the floors. But, I did finish the dishes without passing out and we were both paid $1.oo as promised. We were rich! I couldn’t wait to get to the store (right after I sanitized my hands). There is much more to tell about the Webers but since this article has become so long, I will continue it later…………. This entry was posted in Cape Girardeau, Missouri, Neighbors, Sprigg Street and tagged muscular dystrophy, weber. Bookmark the permalink. Yummy , whats for dinner?